Utah Shop Hop 2018 Passports now available and it's gonna be a PARTY! Are you ready to PAR-TAY? The 2018 Utah Shop Hop is almost here and this year, “It’s a Party!” Wed. May 30th – Sat. June 2nd you’re invited to join in a different party at each of the 14 quilt shops participating across the Wasatch Front. You’ll find a Fiesta, a Luau, a High School Reunion, a Girl’s Night Out… and here at the Corn Wagon we’re throwing a BEACH PARTY! Pack your bikini, flip flops and sunscreen and stroll in for a sewing celebration on the sand! $5 passports are on sale now at all participating shops. Your passport is your ticket to receive an exclusive free pattern at each party along the hop. Collect shop buttons on the adorable party lanyard included with your passport. Get your passport stamped at all 14 shops and turn it in for a chance to win fabulous quilting prizes that are worth partying about! 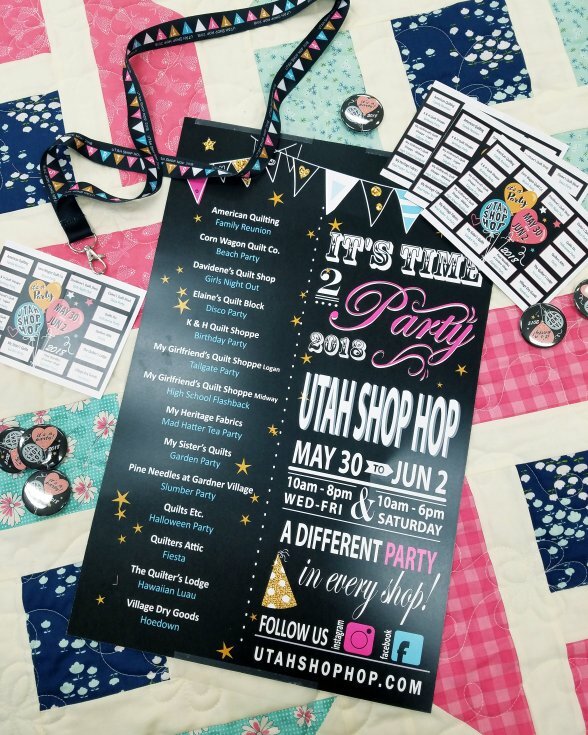 Visit utahshophop.com for more info, prize details and a shop hop map so you can start planning your party route with your best quilty friends right away. We are so excited share new beach themed quilts and fabrics including our exclusive shop table runner designed by Emily Herrick. As always you’ll find treats, coupons, a photo op and a chance to win prizes here at the Corn Wagon. We hope you will join the celebration we look forward to all year! Lloyd and Lola are all dolled up for a good celebration, pom poms and all! 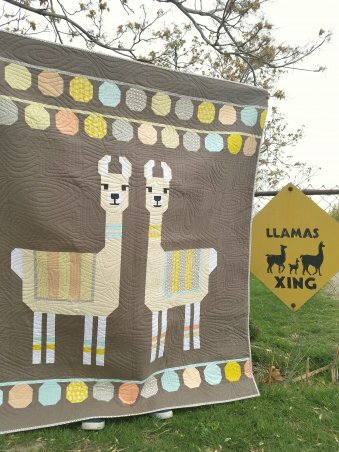 Elizabeth Hartman, the quilt designer famous for her playfully unique animal quilts, has won llama lovers hearts with this one. Her pattern includes instructions for a llama pillow cover, small quilt and large quilt. Our quilt kit includes fabric for the top and binding of the large 61" x 70" quilt shown here. Annette Evans (my favorite Spanish teacher!) made this one and has graciously allowed us to display it at the shop so you can stop in and meet Lloyd & Lola in person! You will also find the cutest No Drama Llama fabric from Dear Stella Designs featuring our llama friends in soft shades of mint, coral and sky. Our handwork club is growing! 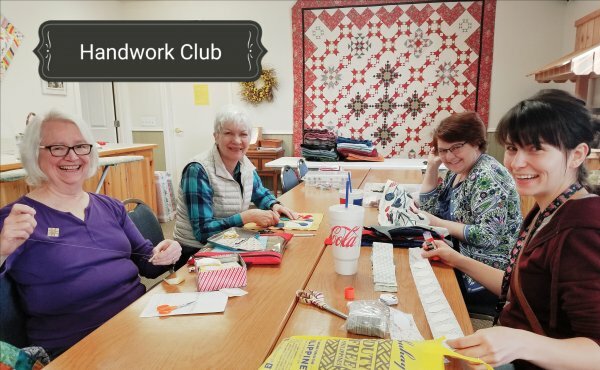 Bring any hand sewing project you like, be it English Paper Piecing, needle-turn applique, wool applique, embroidery, knitting, crocheting, whatever you enjoy stitching by hand, and join this fantastic sewing circle each Tuesday, 10 am – noon here at the Corn Wagon. There is no charge to join. Marianne Michaels leads this group offering tips and new techniques at each gathering. Bring a project you may need advice or guidance with and make new friends who love handwork as much as you do! April 9th - 25% off WOOL! This sale includes all regular price wool sold by the yard, by the bundle, by the ounce and by the bag as well as select wool applique kits! Wednesday's Word is a special offer for our Facebook Friends and Instagram Followers. Every Wednesday you can find our social media post announcing Wednesday's Word. Repeat the word at the register that Wednesday to receive 25% off one regular price item. Remember, Facebook & Instagram feeds are no longer shown chronologically but you can simply bring up our profile to view our posts at your convenience. Hint: the more often you click on our posts, the more regularly we will appear near the top of your feed.